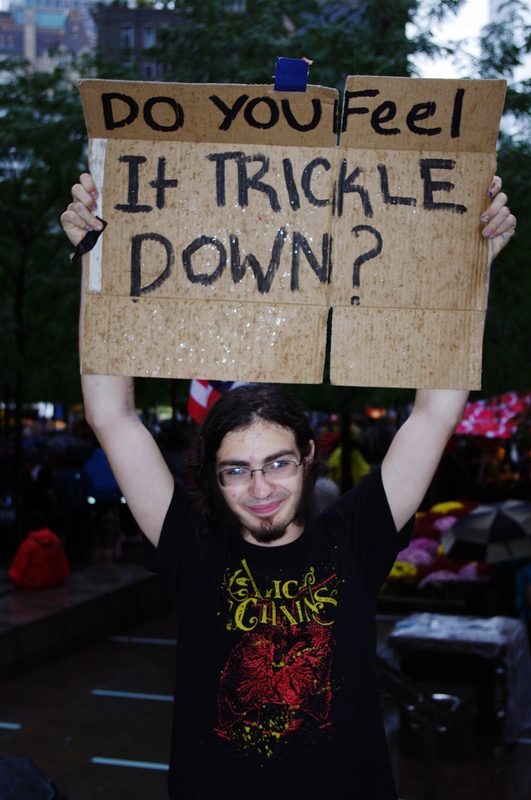 Occupy Wall Street: 10 Suggestions for the 99% Manifesto | Paul's Voyage of Discovery & Etc. At long last, after three decades of Reaganomics and Wall Street sociopathology have hollowed out the US economy and shifted an ever-increasing percentage of our nation’s treasure to the coffers of the ruling class (in a redistribution of wealth that would make Robin Hood blush) – the youth who have been handed an empty burlap sack labeled “The American Dream” have taken to the streets to Occupy Wall Street. And while the GOP and the corporate media pretend to be confused about what these demonstrations are all about, it’s clear to most of us: 99% of Americans are getting screwed by a economic/political system that is rigged in favor of the wealthy, the powerful, and their multinational corporations. 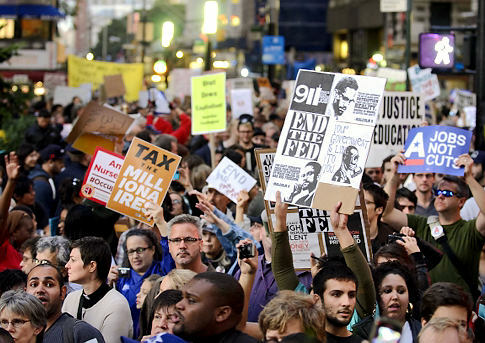 In recent days, the Occupy Wall Street movement has begun to articulate a message, if not a list of demands. Trying to remain inclusive, movement leaders (who spend a lot of time trying to reach small “d” democratic consensus) have largely been content to raise questions and provoke thought and discussion, rather than declare themselves for a specific agenda of legislative and legal solutions to the class warfare being waged against the 99%. The fact that the Occupy Wall Street movement is growing is a sign that their Socratic method is working – even if it confuses Fox & Friends. 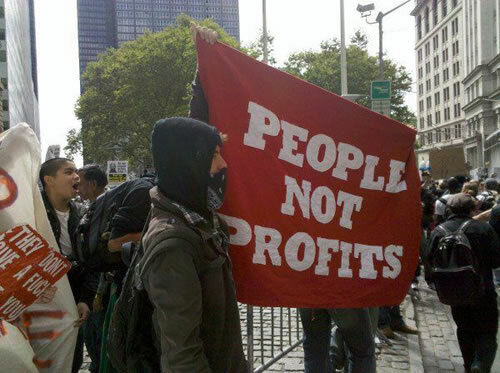 Inspired by Occupy Wall Street, I’ve given thought to the questions raised by those young patriots in lower Manhattan’s Zuccotti Park – and have arrived at 10 suggestions for an as-yet-to-be-written Manifesto of the 99%. 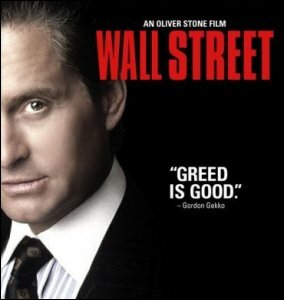 Sorry, Gordon Gekko, but you and your ilk have had 30 years to make your case – and you’ve failed. Your supply side rising tide did not lift all boats — only your mega-yachts. The Ayn Rand devotees in the GOP can push that everyone for his own interests, dog-eat-dog mantra all they want – but that dog won’t hunt. It’s time to relegate Greed to its ignominious place among the 7 Deadly Sins. 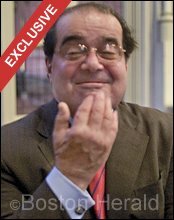 Sorry, Justice Scalia, Roberts, Alito, Thomas and Kennedy, but corporations are organizations licensed by the government (We, the People) to transact certain business under the law (again, We the People). In exchange for this license – which carries with it certain benefits and protections — We, the People can set legal limits to what corporations can and can’t do, and that includes making sure that big business can’t corrupt our electoral system by pouring anonymous billions into political advertising campaigns. NAFTA, CAFTA, I don’t care which Free Trade treaty our government has signed, American workers have gotten the raw end of the deal. As long as Mexican, Chinese and other foreign workers can be paid a pittance compared to the American labor force, and the companies that hire them don’t have to operate under the same standards for worker safety and environmental protection that Americans have fought for a century to establish in this country – then THAT may, indeed, be free trade. 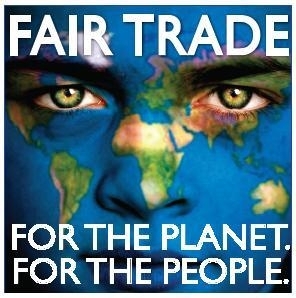 But it is trade free of fairness to struggling American labor and the precious, endangered environment we all share. I’d rather see protective tariffs return than continue to see “free trade” agreements send us racing to the bottom. I have one question for those who say the U.S. Post Office should be run like a business – or that the Post Office should be privatized. 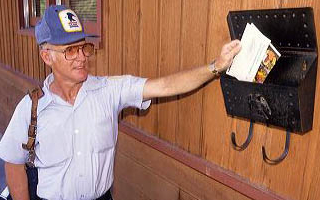 Is it profitable for the Post Office to pick up a few letters from farmers on remote farms in Iowa – or down in some isolated Appalachian valley? No, it’s not. A for-profit operation would soon decide that delivering a postcard to Granny down in the holler wasn’t worth their time and effort. That’s why the U.S. Post Office can’t be run like business: it’s an egalitarian service to all Americans. Consider this: Haliburton had a contract to feed our troops in Iraq (something the Army used to do for itself.) There’s an age-old military practice of staggering meal times for smaller groups of soldiers in a combat zone to avoid predictable concentrations of troops that the enemy can exploit. If the bad guys know all our soldiers eat regularly at a certain time – boom! That’s the time to hit us. But Haliburton decided these staggered times and smaller groups were not cost-effective. It was more profitable to have fewer meal times for larger groups of troops. 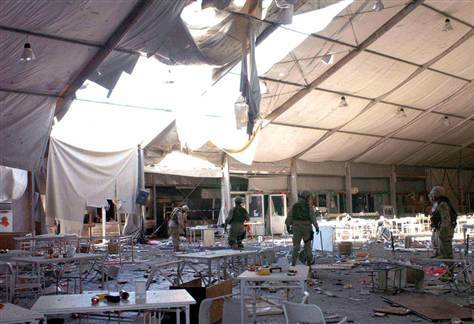 Thus, on December 21, 2004 — as hundreds of U.S. troops and other personnel crowded into a large mess tent in Mosul for their midday meal – a suicide bomber struck, killing 22 troops and contractors and injuring 69. How many lives would have been saved if the Pentagon had not privatized the feeding of our troops? The 8-hour workday. The 5-day work week. Overtime. The end of child labor. Occupational safety standards. Vacation pay. All of these things we take for granted are part of our nation’s fabric because of blood, sweat and tears shed by organized labor. That’s why the conservatives hate unions. That’s why the corporate elite supports GOP governors who run as moderates – then quickly pivot hard to the right to enact their anti-union agendas. We’ve seen it in Wisconsin, Michigan, Ohio and Maine, etc. 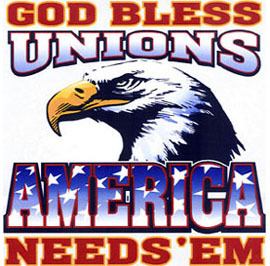 The right wing may have been successful since the Reagan administration in portraying organized labor as corrupt (sometimes with good reason) and detrimental to free enterprise – but, all in all, the unions make us stronger. 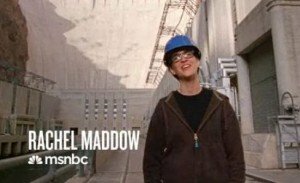 Rachel Maddow says it all in one of her television commercials. Standing in front of Hoover Dam, she makes the point that no person could have paid to build such a massive public works project, no town could have done it, and no state could have done it: it took a nation to build Hoover Dam. The same is true of the Interstate Highway System we all drive on, the water systems we all drink from, the public schools, the military, and that damned Post Office. Locally, our taxes pay for cops, firefighters and other first responders. Taxes make these institutions and services (collectively “the commons”) possible. Taxes are the cost of a civilized society. 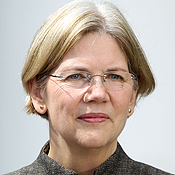 Ss Elizabeth Warren has so succinctly pointed out, the wealthy benefit more from the commons than the rest of us – and therefore, should pay a fair share of the taxes. “There is nobody in this country who got rich on his own. Nobody. You built a factory out there — good for you. “But I want to be clear. You moved your goods to market on the roads the rest of us paid for. You hired workers the rest of us paid to educate. You were safe in your factory because of police forces and fire forces that the rest of us paid for. You don’t have to worry that marauding bands would come and seize everything at your factory and hire someone to protect against this because of the work the rest of us did. Health care is not a commodity and does not work within the capitalist, for-profit, supply and demand economic model. Why not? It’s simple. If I want to buy a car, I have lots of options. 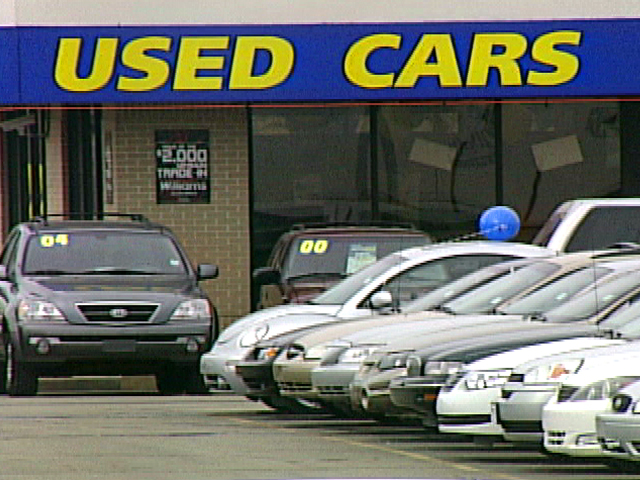 I can buy an expensive new car, a low-cost used car, or a “previously owned” car (which is somewhere in the middle). I have lots of different makes and models and dealerships to choose from. And, if I don’t like the price – I can just walk away. Take the bus, carpool, or ride my bike if I need to. 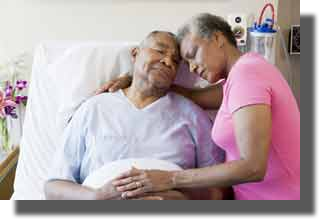 But if your dad drops to the floor suffering a heart attack and the paramedics take him to the nearest emergency room – and he needs emergency bypass surgery – you don’t have a choice. You can’t check out the prices at other hospitals. You must do what’s possible at that moment to save your dad’s life. Likewise, if you have breast cancer, you’re not going to shop for the cheapest treatment — no matter what you’re financial situation is. You must have the most effective course of treatment your doctors recommend, whatever the cost. Capitalist rules don’t apply in health care – which is why all the other industrialized, civilized countries have national non-profit health care systems. Duh. Voter fraud is not a problem in this country. The statistics make it clear that our democracy is not threatened by voter fraud. 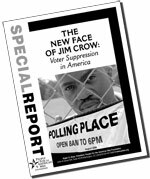 However, our democracy is threatened by the new Jim Crow: GOP-sponsored voter ID laws in an increasing number of Republican-controlled states. In order to defend against a non-existent threat, GOP lawmakers are making it harder for older and poorer folk to vote. Why? Because older and poorer folk (especially minorities) tend to vote for Democrats. When you hear the words “voter ID” – it’s all about voter suppression. 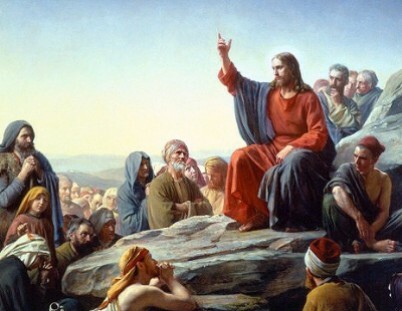 Sorry, all you conservative evangelicals at the Value Voters summit, but Jesus was a lefty. He was all for helping the poor and the sick. I don’t remember a single miracle in which Jesus restored a merchant’s business to profitability. In fact, He had some tough words for the rich. “Again I tell you, it is easier for a camel to go through the eye of a needle than for a rich man to enter the kingdom of God.” No ambiguity there. 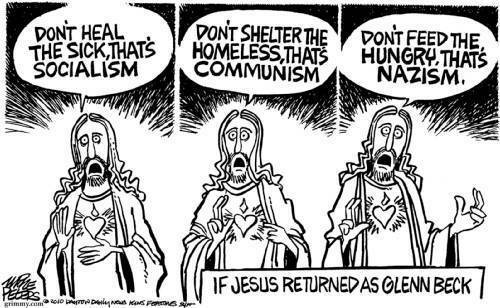 Now, Jesus wasn’t into class warfare. In fact, He wasn’t into war at all. “Blessed are the peacemakers.” I could go on and on. 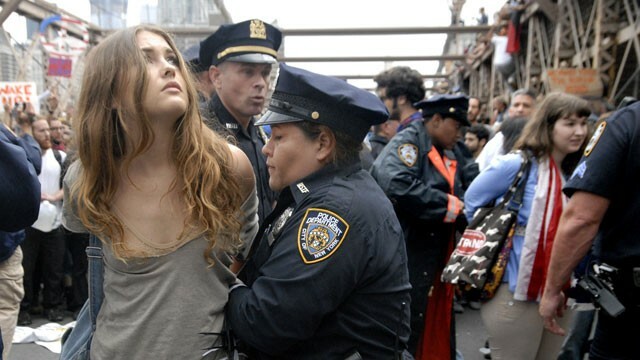 Jesus never uttered a word against homosexuals, He urged us to visit people in prison, and He wanted us to, above all, “Love each other as I have loved you.” Sounds like one of those freaking, bongo-playing hippies in Zuccotti Park. Bless them all. RIGHT ON! You have GOT to offer your assistance to the Occupy Los Angeles folks. They need HELP. 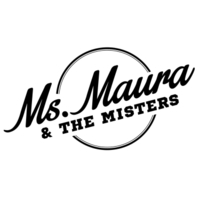 And by the way…..HAIR is in San Diego 10/18 – 10/22……The American Tribal LOVE Rock Musical! suggestion for a sign: WWJD? What he did the first time – Stand for the poor. Can anyone think of a better 10 suggestions? I don’t think so. Wonderfully thought out and wonderfully put, Paul. In 1907 the greatest of the depressions occurred and hundreds of thousands of people were bankrupt and suffering. The bankers said, “We must do something in order to establish a system in this country that will enable us to survive and prosper.” So in November 1910, a group of the most powerful men in the world and the leaders of the financial system in the United States met at J. P. Morgan’s private hunting estate on Jekyll Island, off the coast of Georgia. What these bankers wanted was a system that would appear to be established by the federal government and in which that government would take complete responsibility for all the obligations issued by the bank. But the notes issued by the bank would be private paper, controlled entirely by the banking system. The banks would then be able to control the money supply, determine what the interest rates would be, and what credit would be extended. It would be a system by which they would achieve total control of the country and the people therein. Conspiracy germinates and grows in secrecy. The conspirators spent about two weeks on Jekyll Island. It was probably the most secret conclave that has ever taken place in American history. They went to Georgia from New York in a sealed train. They used code names. They sent the regular estate servants ashore for vacations and hired a temporary group of servants who didn’t know any of them. They battled for about two weeks and gradually agreed upon certain principles that would be the basis for a new American banking system. When they came back from Georgia, Aldrich, who was a stately old solon from Rhode Island, introduced what he called the Aldrich Banking Bill. Since it stank to high heaven of Wall Street it was rejected by the Senate Banking Committee out of hand and never got to the floor of Congress.